KUCHING: It was a birthday party like no other for Tun Abdul Rahman Ya’kub, one of Malaysia’s most fiery politicians in his heyday. He used the occasion of his 80th birthday bash at the Kuching Hilton here last Thursday to publicly display that his 20-year-old strained relationship with Chief Minister Tan Sri Abdul Taib Mahmud is a thing of the past. That he has buried the hatchet once and for all with Taib, his nephew who succeeded him as Sarawak Chief Minister in 1981, was abundantly obvious to some 1,000 guests. 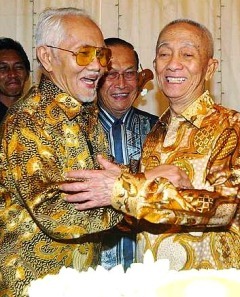 When he greeted Taib on his arrival at the hotel, the famous uncle and nephew locked in a warm embrace. Later on stage, during the birthday cake cutting ceremony, they again embraced not once but twice in a gesture reminiscent of the old days. But this nostalgic episode was not totally unexpected. The octogenarian father figure of Sarawak, in an interview widely published by local newspapers here, revealed he had patched up his misunderstandings with Taib, saying that “blood is thicker than water”. One of the best orators to grace the Malaysian political scene, Rahman made a big impact in his short stint of only a year as Education Minister before he returned to Sarawak as Chief Minister in 1970. He took the bold and landmark move of changing the country’s education landscape by changing the medium of instruction in schools and higher learning institutions to the national language, Bahasa Malaysia. The birthday party’s guest list had a glittering array of family members, friends and politicians who fell out of favour with Taib when they threw their support behind Rahman during the political crisis in the 1980s. Guests from outside Sarawak included Toh Puan Rahah Mohd Noah, widow of second prime minister Tun Abdul Razak, former Sabah Chief Minister Datuk Harris Salleh and Pehin Isa, the former adviser to the Sultan of Brunei, who came from London where he now lives. There was an air of anxiety when the master of ceremonies invited Rahman to the stage to “do what he is famous for”. In a magnanimous act, he described Taib as yang saya sentiasa sayangi (one whom I've always loved). Rahman, the first bumiputra from Sarawak to graduate as a lawyer in 1958 from London’s Lincoln’s Inn, spoke about how he persuaded Taib, 10 years his junior, to also take up law. “With law degrees, it was my view that both Taib and I would be better able to serve the people of Sarawak,” he recalled. Taib himself graduated in law from Australia. He spoke very fondly of first PrimeMinister Tunku Abdul Rahman who brought him into politics and Tun Razak “who taught me politics”. “Because Tun Razak did not have any daughters, being blessed with five sons, he actually wanted to adopt one of my daughters but my wife Normah did not agree,” said Rahman, whose eight children with Toh Puan Normah are all girls. But as fate would have it, a Rahman sibling, Khadijah, later married Razak’s son Datuk Nizam. Rahman said it was Razak who instructed him to return to Sarawak as chief minister mainly to tackle the protracted communist threat and insurgency. He was referring to the former leader of Partai Rakyat Kalimantan Utara, who together with 482 communist guerillas, laid down their arms in 1974 under Operation Sri Aman which Rahman initiated. Bong was invited to the party but did not attend. It marked the end of the years of communist armed struggle and one of Rahman’s finest achievements. Rahman quit as chief minister in early 1981 after undergoing a heart operation in London. He was then appointed Yang Dipertua Negeri, and after four years as head of state, he again had to step down for health reasons. One of the most poignant moments of the party was a slide presentation which included several postcards which Rahman, as a law student in London in the 1950’s, sent to Normah, his then fiancée in Miri. He wrote like a young man professing profound love for her and this received thunderous applause from the audience. “My darling Rose, for you I live, for you my ambition burns. From you, Rose, Rahman learns what faithfulness to each other brings. Your loving fiancée,” he wrote. Rosemary was Normah’s Christian name before she embraced Islam when she married Rahman in 1956 in London. “Children, grandchildren and home,” was how Rahman described his daily chores over two decades after leaving active politics to take his own special place among the nation’s Hall of Fame. Another is his devotion to personally conduct free religious classes for the public.